Why is an email contact form better than an HTML email link? Learn which to use on your WordPress site. Before contact forms were easy to build, HTML mailto links were common online. A quick click opened your email software, and a message could be sent directly. At first glance this may seem like a simple alternative to contact forms. So why should you remove the mailto links on your website and replace them with Formidable forms instead? Most web designers like myself think of HTML mailto links as an old-school thing. They were popular years ago, back when WordPress was in its infancy and Dreamweaver was the go-to tool of web design. But mailto links aren't used much on modern sites. Why not? The internet changes fast, and what was standard 5 years ago is often considered obsolete today. But mailto links didn't just get replaced by something better. There is a big reason they fell out of favor! Do you get annoying marketing phone calls? I often get calls about SEO services, and getting my site on page one of Google (they're ALL scams by the way). Sometimes I get calls telling me there is an issue with my computer and asking to fix it with remote access. It's safe to say that 99% of unsolicited calls are scams of some description, at least in my part of the world. These calls are annoying - but because phone calls cost money, they're not overwhelming. The cost of calls is the reason you don't need to keep your phone number secret. Email however is virtually free, and it's practically a Utopian concept for spammers and scammers. All that they need is your email address - and that isn't hard to get. Specially designed software trawls through the internet constantly looking for email addresses and adding them to lists. The easiest place to find email addresses? You guessed it - HTML mailto links! HTML email links display your contact email address in plain text. It's un-encrypted and visible for the whole world to see. It's super-easy for spammers to copy your email address to their mailing lists. A contact form allows your visitors to get in touch, without ever divulging your email address. This prevents spambots from seeing your email address and adding it to mailing lists. Take a look at our blog post on the benefits of having a contact form on your website. This simple change from email links to contact forms can make your inbox a much friendlier place. It's easy to do, and looks great on your website too. 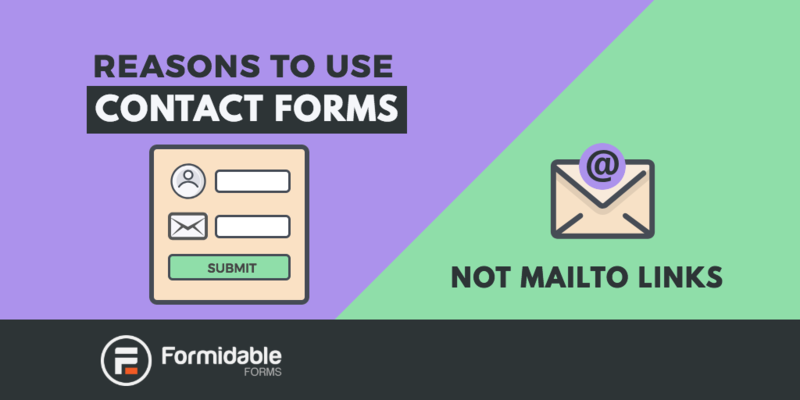 Switching to email contact forms is easy. The first step is to remove any mailto links from your site immediately. Double check your header, footer, widgets and page content to make sure they're all gone. Next, go to the Plugins page in your WordPress dashboard. Click the "Add New" button and search for "Formidable". Install and activate Formidable Forms on your website. Navigate to the "Formidable" menu, select "Forms", and click on "Add New". Click to load the template for the "Contact Us" form. The default contact form template includes fields for first and last names, email address, subject, and a message box. These can be customized if you prefer. The default email will send to the admin email configured in your WordPress settings. This address and the email message can be customized. Save your changes and return to the "Forms" page that displays all your current forms. Copy the [formidable id=x] shortcode from the right side of the page, and paste that shortcode into your contact us page where you want the form to appear. That's it! In 7 simple steps and less than 10 minutes, you have a professional contact form on your WordPress website! Email contact forms can be as simple or as feature-rich as you want. Check out our beautiful contact form design in WordPress (with examples) for inspiration. Not using Formidable Forms yet? 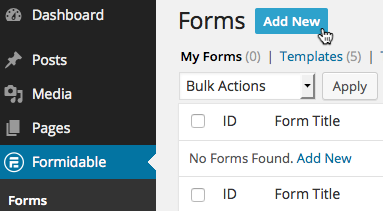 Learn more about the features that make Formidable Forms the best online form builder plugin.